The Hunter’s Bend is a fairly young knot. 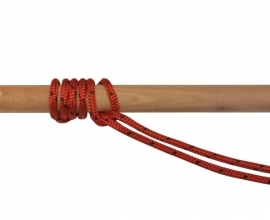 It is claimed to have been invented by Dr. Edward Hunter in the late 70’s, although there’s is some debate if this is the actual origin of this knot. 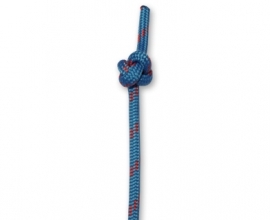 Considering the simplicity of the knot, we like to believe it is much older. In the end it’s all the same and this is quite an easy knot to tie. Be careful for which purpose you use this as it has the tendency to jam when put under strain. 1. 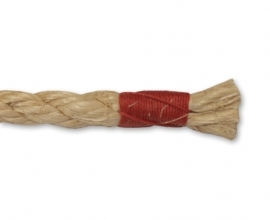 Lay two ropes next to each other, the working ends facing in opposite directions. 2. Create a crossing turn in line A with the working end crossing underneath the standing end. Take the working end of line B and tuck it underneath the standing end of line A. Follow line A around so the working end of line B is at the front of the knot, next to the standing part of line A. You should now have two crossing turns intertwined. 3. Take the working end of line A and tuck it through the center of the two crossing turns, front to back. Take the working end of line B and pass it underneath the standing end of line A and tuck it trough the center of the two crossing turns, back to front. 4. Dress the knot by pulling the standing ends in opposite directions. 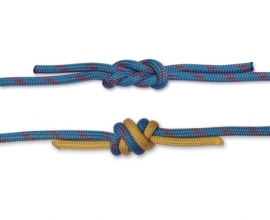 Make sure both working ends stay tucked through both crossing turns while dressing your knot.